We just learned about the famous painting American Gothic by Grant Wood. 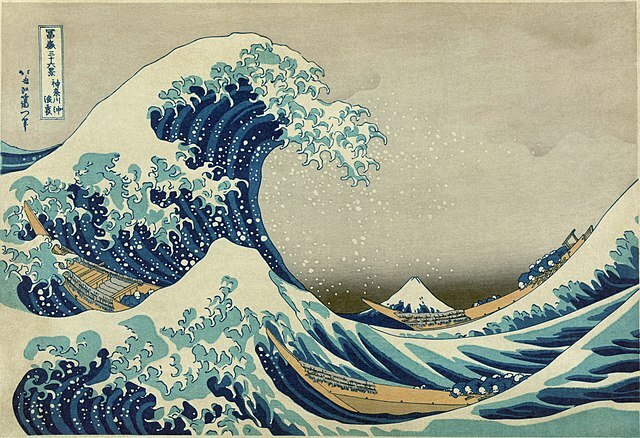 Another famous piece of art is the painting The Great Wave off Kanagawa by Japanese painter Katsushika Hokusai in 1830. This enormous wave in the painting is a wave of the open sea, called okinami. If you look in the background of the painting you can see Mt. Fuji in Japan. The style of painting for this artwork is called ukiyo-e, which means pictures of the floating world. The paintings were woodblock printing, which was a special way for people to make paintings. First a painter would paint a picture on a piece of very thin paper called washi. Then someone would glue the paper on to a piece of wood, where a carver would carve traced lines through the paper into the wood to match the painting. Then they would remove the paper, and paint the colors on to the wooden block. Next another piece of fresh paper would be put on the block, and pressed hard against it using a tool called a baren. When the paper was pulled away, it would have a print copy of the original painting from the block. Using this style, they could make many copies of the artwork and sell them to the rich people in the area.